Rhode Island appears on track to become the first state to have offshore wind power after the state’s Supreme Court upheld a power-purchase agreement between National Grid and Deepwater Wind. 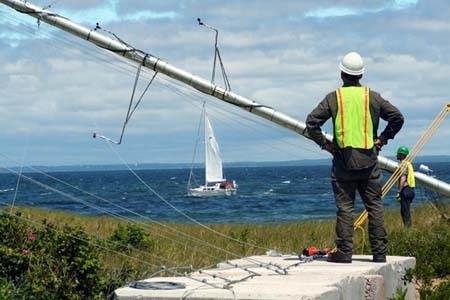 The wind power plant is proposed for a site three miles off Block Island. The demonstration project would consist of five turbines capable of producing up to 30 megwatts (MW) of power, providing 90 percent of the island’s energy needs. The remainder of the island’s power would be supplied from the mainland via a new transmission system developed in conjunction with the wind farm – allowing the island “to power down and place on standby the expensive diesel fuel generators” that it now uses for power, Deepwater said. The power agreement that the Supreme Court upheld calls for a cap of energy costs at $0.24/kilowatt-hour (kWh) during the first year of commercial operation, which translates to around $1.35 per month for a typical household in Rhode Island, Deepwater said. Under the agreement, Deepwater cannot exceed this cap, must return any savings back to consumers and is required to absorb any construction-cost overruns. Total investment for the project will be approximately $250 million with $10 million already invested into the project by Deepwater. Deepwater hopes to begin construction on the project next year and complete it in 2013 or 2014. The project will create approximately 200 construction job and generate more than $100 million worth of economic activity in the state, the company said.